Unlike episode one of The Council, episode two immediately grabs the player’s attention. It starts with the revelation that Elizabeth Adams is dead, which may or may not be a surprise depending on the choices you made in episode one. Lord Mortimer tasks Louis with investigating the nature of Elizabeth’s murder. Various evidence points to multiple potential culprits and it’s up to the player to decide who did it. Unfortunately, this narrative thread is quickly placed on the back burner when Louis once again returns to look for his mother. While Louis’ concern for his mother is reasonable, the murder of Elizabeth should’ve felt more pressing. Based on the choices made during the investigation there was no real resolution or a demand for one, making Elizabeth’s death feel unimportant. It’s likely that this will play a role in later episodes, but as it stands, the lack of immediate concern from the cast of characters about a guest being brutally murdered made it hard to focus on the task at hand. By the end of episode two it’s clear that Louis’ mother hasn’t so much disappeared as she is hiding. Based on clues left behind by Louis’ mother, he discerns that she had growing concerns about one of the guests on the island, but the who remains unclear. In fact, most of the mysteries established in episode one are only further complicated by episode two. The mystery surrounding Lord Mortimer only grows more complex with the introduction of occult objects in his possession and his desire for the “holy spear.” It seemed like Lord Mortimer would resolve at least some of the questions posed by episode one when he suggests that he’s going to explain why everyone is there, but the episode ends before he can say more. There is also the introduction of the final guest, Manuel Godoy. He is the Secretary of State and Head of the Spanish Government and, like the other guests, shrouded in mystery. Similar to the previous episode, the ending poses even more mystery and will have you yearn for the next one. Episode two does a good job of maintaining a balance between more complicated puzzles and helpful skills. Puzzles are challenging, but offer players a chance to use skills to help solve certain riddles more quickly depending on how they chose to upgrade their skill trees. The skills are also balanced. Regardless of what area of expertise a player chose, they have the ability to use their skill sets to aid in their investigation. Episode two isn’t without fault. Elizabeth’s death was not treated seriously enough and Louis’ voice acting still falls flat with most of his delivery, making it hard to engage with the history he often introduces. This can also make already complicated puzzles more challenging because it is difficult to discern what information is important or should be questioned. The long treks down corridors was more tiring this time around. In the first episode, wondering the halls made sense, as players got to know the mansion, but in episode two it just felt like unnecessary padding. If there were additional clues or information about characters found in the hallways, the long walks from one room to another would make sense. But the corridors were often empty and offered no additional insight into the investigations. While the mystery revolving around Louis and the other characters is interesting enough to engage players, there are still some pacing issues with narrative threads that hopefully resolve in later chapters. 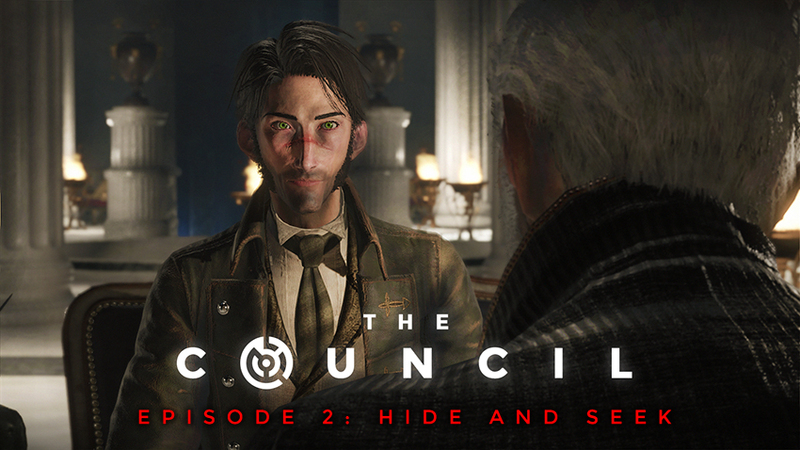 Episode two of The Council certainly raised more questions than it answered, but doing so only increased the anticipation for episode three.